How about a little support……..
I’ve been on a tear to lighten my camera bag! It all started a few months back when my doctor asked if I would like to have some more shoulder surgery!!!??? I said no way, and he said then stop carrying a 25 pound camera bag! So I’ve been working on how to lower the weight, it’s an ongoing process! 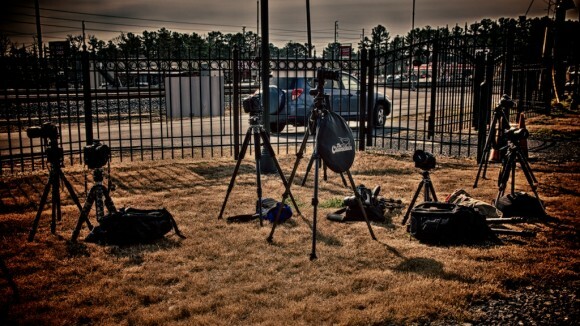 My tripod, which is my constant companion was another thing all together! Those of you that know me, know I live and breath by a tripod! I’ve often said the only person that can hand hold a camera completely steady, rigor mortise has set in! If you have a heart beat you’re moving….. So how to get a really sturdy tripod that cuts the weight in half??? 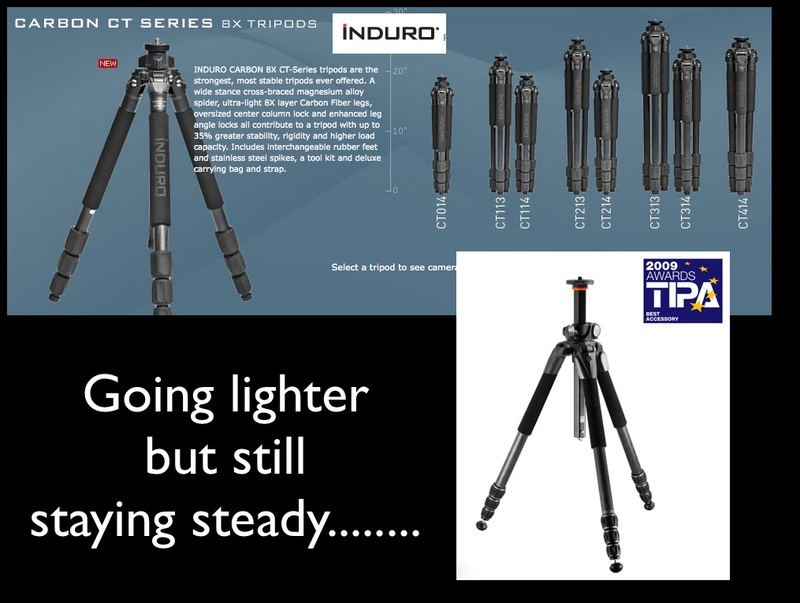 Thankfully in the last decade a lot of progress has been made in tripods! My go to, everyday, tripod is an old Gitzo 1348 Carbon Fiber 3 series, it has served me faithfully for almost twenty years!!!! I own other tripods and use them for special applications but they almost never travel with me, just too big and too heavy! So recently I picked up two new smaller, but still very good quality tripods for my new lighter travel system. First why not another Gitzo? Well, frankly cost. There is not questions that, at least in my opinion, Gitzo is still king of the hill, but they are not cheap. I have several friends that were using a couple of other brands and spoke highly about them, so I bought two different ones, and like them so much I’m keeping both!!! Ugh, more weight!!!!! The first is the Induro CT-214. the legs alone are around $400. and it is extremely well made and feels very substantial, yet has shaved several pounds off my normal Gitzo carry tripod. I’m using the Really Right Stuff BH-30 head and it works great and has really reduced the weight. It’s also short enough collapsed to fit in most of my suitcases which is a big plus for travel. I bought the shorter center post so I could take it almost to the ground, a must for me. I do also own the Kirk Low Pod, which I find great for ground level close-up work and for close-ups in the studio! My friend Vincent Versace loves his Induro and I’m glad I took his recommendation, this is a great and affordable tripod! Another shooter and good friend, David Akoubian, showed me his Vanguard tripod which had a very unique feature which I’m finding very valuable, a tilting center post for extending the camera out over the subject. 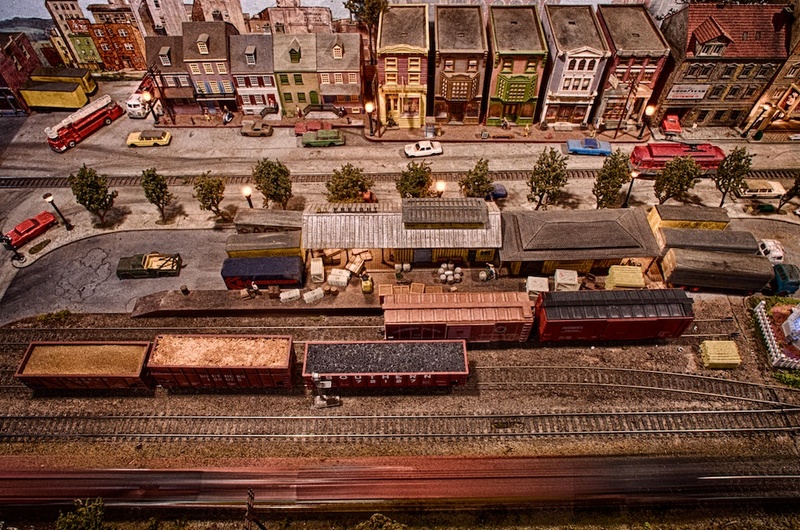 When I first was shown the feature I didn’t think much of it, then a friend, Eric Wojtkun, made a killer shot at the Southeast Train Museum with a tripod that had the same feature, when I saw him use it and saw the shot, below, I was hooked! 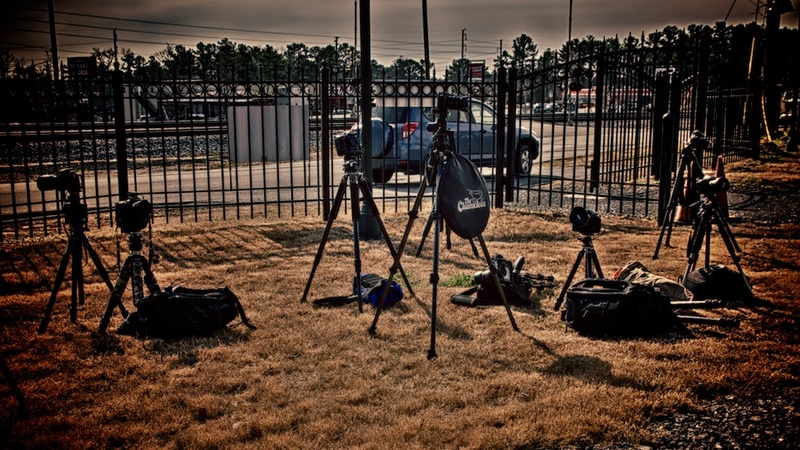 This tripod I picked up is the Vanguard Alta Pro 254 CT and it is another big time winner! Just like the Induro it is made of high quality carbon Fiber, has great one twist leg locks, and the center column tilting feature works super easy. For around $320 it is another steal!! It is slightly smaller than the Induro which is not a bad thing, yet it is very sturdy and well built. It came with their BBH-100 ball head that accepts Arca Swiss plates, it is very well made, and functions solidly! By being able to make the center post go out or down you can get a new angle on the subject as Eric did on the model train shot below!! While I would not recommend hanging a D4 with a big lens out to the side a smaller camera like Eric’s Pentax K-5 can be supported very well indeed. By placing the camera over a barrier and right over the subject Eric was able to make a shot I wanted but could not make with a conventional tripod I was using!!! I think these kinds of devices can be more useful than I had imagined when using a smaller camera. Thanks Eric for opening my eyes to another great way to approach and make a shot!!! Here is Eric’s wonderful HDR image! So the moral of the story is, if you can’t foot the bill for the most expensive tripods out there, we now have some very capable and affordable alternatives! Now if I can just figure out what to leave out of my camera bag or reconfigure my carry system, maybe I won’t be doing any more surgery!!!!! Epilogue: After publishing Eric’s image, he sent this one from our recent workshop, just too good not to be the ending shot! I agree, it is a well made unit and performs great! I did end up taking out my trpoid after all, but those clouds were gone. I still didn’t get a great picture of the moon, though. I could see the details of the moon through the lens, but they were obscured by the light on the film . I do love the way those clouds were swirling around, though! I was surprised at the quality, it is a wonderful tripod. I have had a shoulder replacement, and just recently had rods and screws put in my neck so I would recommend a belt and harness system, or just a belt system. I can’t carry all my lenses but can keep what I have readily at hand, and I use a Peak Design Capture clip as a third hand for changing lenses. I transport that setup in an overnight bag until I get where I am going, or I use a roller bag when traveling heavier. I have also considered a vest and belt but haven’t tried that yet. I really miss being able to shoot from the Lowepro Slingshot I used to have but can’t take the weight over my shoulder. I understand I’ ve endured rotator cuff surgery myself! Hope this isn’t a bad question but it might be interesting to read your thoughts one day about why you need to use a tripod with the faster shutter speeds / higher ISO’s and VR lenses available today. I’ve actually been experiencing a renewed ability to hand hold because of much improved High ISO performance leading to higher shutter speeds. I am doing more handheld work than in year, and with some success, but I still believe, however, that the best sharpness comes from a solid platform like a tripod! It’s nice though to have the added help of low noise, high ISOs!! !